What is the difference between sloops, cutters, schooners, and ketches? People always ask this. Well here it is. A sloop rig has 1 mast, with a jib and mainsail. A cutter is a sloop with 2 foresails(jib, staysail) and a mainsail. A ketch has 2 masts. It has a foresail,main and missin. It could have a staysail, if it is a cutter ketch. A yawl has 2 masts, one behind the rudder post. The jigger on the 2nd mast is a control sail, not normally used for upwind power. A schooner has 2 masts, the 2nd mast is taller. It may also have additional masts, up to 7. 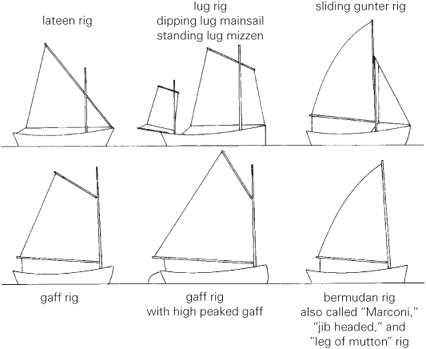 Normal configuration consists of jib, staysail, foresail and main. You can add topsail, and/or yankee jib and fisherman sail. Others include a dhow, junk, and catamaran and trimaran. Larger includes ships, barks, barkentine, brig,brigantine, and sloop of war.